Nineteenth Century and Colonial history and wargaming links, for the period between the Napoleonic Wars and the First World War. A colonial wargaming website from Robert Cordery. Phil Barker's naval rules for pre-dreadnoughts. Sir Harry Flashman is one of the great creations of modern literature. First encountered as the school bully in Tom Brown's Schooldays (1857) by Thomas Hughes, he was thankfully rediscovered by George MacDonald Fraser (b.1925) who purportedly edited the Flashman papers starting with Flashman in 1969. The series has now run to twelve volumes. Taking us from the classrooms of Rugby School, through the Afghan Wars, the Crimea, the United States, China and the Indian Mutiny. Fun gaming ideas in a fictional world, not averse to Land Ironclads and other "Spurious Victorian Armored Fighting Vehicles". Another War of the Worlds enthusiast with Martians! 19th Century photographs, campaign medals, and biographical studies of the soldiers. Details of armies and wars. TSATF is a set of fun and simple colonial era wargames rules. It was first published in 1979, and there are now lots of variants for specific wars (Indian Mutiny, French in Mexico, WWI desert, Moro rebellion, Canadian North-West Rebellion, Sikh wars, and also conquistadors and early renaissance). An interesting collection of rules, information, pictures and links. Includes amongst other things pre-1700s colonials, and some photos of NZ Wars battlesites. An international society whose principal aim is to encourage and foster the study of military aspects of the Victorian era. The dates of study are 1837 to 1914, to include the period between the end of Queen Victoria's reign and the beginning of World War I. VMS publishes the journal Soldiers of the Queen. A New Zealand historical re-enactment group. "We represent members of the Light Company of a regular British Army unit stationed in New Zealand from 1846 to 1865. We are uniformed in both the parade 1856 pattern red tunic as well as the navy blue campaign uniforms worn in New Zealand during the 1860s." Including Fort Takapuna, Hauraki Gulf defences, North Head fortifications and disappearing gun, and Stony Batter on Waiheke Island. The locally raised Armed Constabulary that replaced the Imperial forces. The New Zealand Electronic Text Centre has several books written in the 19th and early 20th centuries, including amongst others: Reverend Robert Burrows, Extracts from a Diary during Heke's War in the North in 1845; Octavius Hadfield, One of England's Little Wars; and James Cowan A History of the Maori Campaigns and the Pioneering Period. The Musket Wars of 1818-1833 and the New Zealand Wars of 1843-1872. Danny Keenan's site on the causes, campaigns, and consequences of the wars of 1843 to 1872. Articles from the History Orb. The Musket Wars and the wars of the 1840s to the 1870s. Ruapekapeka Pa Historic Reserve encompasses the pa, and advanced and main British positions from which the battle was fought. 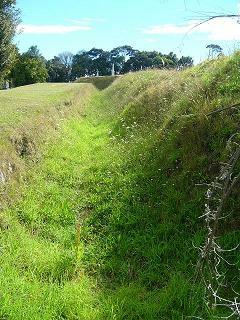 The ditch and bank defences of the pa are still visible along with one of Kawiti抯 cannon and the well which supplied water to the defenders. The earthen defences of the advanced British position are also still visible. The war in Mexico and California: History, Images, Documents, Maps, Historic Sites, Reading List, FAQs, Chronology, Statistics, Artifacts. Website of the PBS television documentary. The organisational history of the land forces of the Austro-Hungarian monarchy from just prior to the outbreak of the Great War until the collapse of the monarchy in 1918. 1849 battle between Piedmontese and Austrians. Battle between the Austrian army and the French-Piedmontese army on 4 June 1859. After the battle, a real bloodshed, the noun "magenta" was adopted to describe a bright purplish red, blood red. Organisation and uniforms of the Sardinian Army in the Italian first independance war. An article from the Legio Heroica website (they do a 20mm range of figures for the 1848 war). Sources, texts, commentary and background data. A Russian military history website which also has information on other 19th and 20th Century wars. Overview, chronology, contemporary documents, FAQs about the Crimean War 1854-1856. Lots of documents, including translations from Russian, about Russian military history from the 18th Century onwards with much on the 19th Century and Crimean War. Timeline, battle maps and pictures. Links to photographic collections, regimental histories, re-enactors, and other stuff. A long detailed list of actions in the Civil War. Among the reconnaissance, sketch, and theater-of-war maps are the detailed battle maps made by Major Jedediah Hotchkiss for Generals Lee and Jackson, General Sherman抯 Southern military campaigns, and maps taken from diaries, scrapbooks, and manuscripts. History, muster rolls, photos, and lots more information. 1100 scenes of military personnel, preparations for battle, and battle after-effects. Civil War battles, biographies, medicine, essays, statistics, letters, armies, naval, strategy and tactics. A 128-volume collection of the official records of the Union and Confederate armies. A website in Danish and German about the war between Denmark and the German allies of Prussia and Austria. Naval and land actions of the war. Franco-Prussian adaptation of the Fire and Fury rules. "1870" Grand Tactical Rules for the Franco-Prussian War. As well as the rules and scenarios, the book includes a large amount of historical information about the armies and battles. A society formed by a small group of experts and historians to educate, entertain, enlighten and encourage students past, present and future, and to further their interest in that most fascinating of Victorian campaigns, the Anglo-Zulu War of 1879. Outline of the battles, sieges and other actions of the war of 1879. By Ian Knight, author of many books on the Zulu Wars. The action at Rorke's Drift, Wednesday 22-Thursday 23 January 1879, when some 150 soldiers defended a supply station against some 4000 Zulus. Causes, effects, and events of the war. Colonial Adventure Wargaming in Africa 1880-1920. Italian website about uniforms and army organisation. Cuban Revolution of 1895�, Spanish-American War of 1898, Philippine-American War of 1898-1902. A place for the historical miniatures gamer to learn a little about the small wars of the United States during the period 1870-1940, ranging over the globe, but mainly focusing on the "Banana Wars" fought in the Caribbean in the early 1900s as well as the gunboats on the "Yangtze" River in China. Lots of information about the war. Introduction, chronology, photos and maps. The South African War, original and contemporary sources. New Zealand's involvement in the war. Info about the Russian navy from mid-19th Century to the Russo-Japanese War. A collection of books about the Russians in the Far East and North America. Includes some accounts from war correspondents and observers of the Russo-Japanese War. Images, maps and information on land and naval campaigns.